Founded in 1913, this small community of log cabins still maintains the spirit Henry Shaw envisioned when he purchased the land. A handful of cozy log cabins nestle in the white pine forest overlooking the rushing mountain stream that borders this peaceful resort. 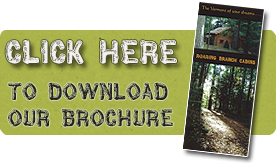 Now known as Roaring Branch Cabins, this tranquil oasis appeals to those who like the smell of pines, the sound of a stream, the casual informality of a hike in the woods, a game of tennis followed by a swim in the clear water of the stream, and then a peaceful night beside a roaring fire in the cabin's fireplace. All of this within minutes of fly fishing, kayaking, canoeing, horseback riding, restaurants, outlet shopping, museums, theater and so much more. And it is a mere three to four hours from New York and Boston! Each cabin is known by its name, such as Owl's Nest, Partridge, Woodchuck, Rabbit Warren, and Chestnut Burr. Each includes two bedrooms and a loft area that sleeps two, so that cabins comfortably accommodate six. All cabins also have living rooms with vaulted ceilings and stone fireplaces, fully equipped modern kitchens, dining areas, and 1 1/2 to 2 bathrooms. Cabins are well spaced throughout the tall pines and winding paths that ensure privacy on your vacation. Spending time on the covered porch with a view and sound of the stream below is relaxing as can be. And while you are doing that, the kids can head over to the swings, the badminton or composition tennis courts, the basketball area, tetherball, horseshoes or ping pong pavilion. Or head down the steps to the stream to fish, explore or cool off. On a rainy day, there is a little log library and game cabin to snuggle into. This unique place offers all season old-fashioned vacation fun in the most quiet, restful setting you can imagine. 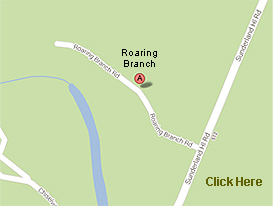 Roaring Branch can offer a magical respite from the everyday stress of life for couples, and the single traveler as well. Cabins rent by the week during the summer, or for three days or more during the winter. Come Visit Us Soon - Where the Vermont of Your Dreams Awaits You!